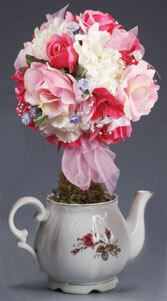 A burst of bright silk flowers affixed atop a delicately-painted teapot, this topiary makes a beautiful centerpiece. Display with our Teacup Roses Topiary! 1. Paint twig gold; stand in 1" foam scrap to dry. 2. Using wire cutters, trim flower stems to 1". 3. With pencil, make a 3" deep hole in foam ball; glue twig in hole. 4. Glue and insert flower stems in ball; continue, until ball is covered. 5. Cut up 1" foam sheet and fill teapot with foam pieces; glue foam in place. 6. Using pencil, make hole in center of foam. Glue twig in hole. 7. Cover foam base with green moss. 8. Cut nine 8" lengths of ribbon; twist wired floral pick around center of each. Arrange pics around ball; glue in place. 9. Make four-loop bow with remaining ribbon. Secure with floral wire. Glue bow to bottom front of topiary. 10. Glue pearl loops and 14mm pearls among flowers. My friend just gave me a lovely antique teapot in ivory with gold filigree that was a part of her mother's collection. Using this beloved and beautiful gift for this project would be an ideal way to set it off and eliminates the worry of filling it with water every time I want to,use it as a vase since it is tall and narrow at the top. This can give it new life and also the place of honor it deserves! Thanks for sharing a great project and idea! What a cute idea! I also like to watch the 2nd hand stores for the tiny old teacups too. They make nice little gifts for your fellow crafters. Just take your cup and turn it upside down. Trace the cup edge on a piece of fabric that complements the cup. Add a quarter inch to the edge mark and cut out. Then fill your cup with fiber fill stuffing and cover with the fabric piece, carefully tucking in the edges around the fill. Using a glue gun, place glue between the inside of the cup and the tucked in edge of the fabric leaving a small area open. Add more stuffing until it is firm and seal the hole with more glue. It makes a cute little pincushion even if there is no saucer and takes only a few minutes to make. Another tiny gift for your favorite tea drinker is to take a tea cup, place a wick and fill with prepared candle wax. These make cute gifts especially if you do have a matching saucer. If you don't have time to craft a gift, you can purchase a few different types of teas and place an assortment of tea bags into a teacup. Accent with an vintage or antique teaspoon when wrapping.